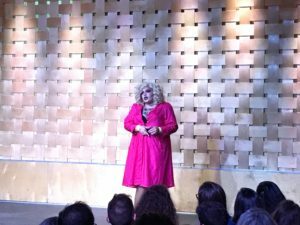 On Sept. 22 at Axis Nightclub, Ally Cummings, junior, performed to the sold-out crowd in So You Think You Can Drag. For those who aren’t familiar with the world of drag, there are many different types of performers; these can include: comedy queens, fashion queens, alternative queens, fem/bio/hyper queens, drag kings, non-binary queens, and trans queens. Drag originally started as a political statement, representing all that mainstream society told it that it could not be. It has evolved and is now a more inclusive scene that supports all things that each person stands for. Axis Nightclub, which is located in the Short North, is a LGBT dance club. While having previous experience with the looks and makeup, Cummings had never actually performed in a show before. She decided that she would use Just a Girl by Gwen Stefani as her song of choice. “I thought [the song] connected since I knew about the bias of being a woman as a drag queen. I wanted to take a feminist stance and remind everyone that all drag is valid,” Cummings said. The production was full of energy and glitter. She received a big boost of confidence knowing that she could perform to that sold-out crowd doing something that she loved without having to worry about what the people in the audience thought, because they loved it just as much as her. Cummings was active in musicals and plays in the past, but admits that her experience at the drag show was far better. Participating in drag was always something Cummings wanted to do. Her first show was at Capital for the Pride fundraiser they had last year. It was an eye-opening experience for her and she has been mesmerized by it ever since. She loved that they could raise so much money for something they love by doing something they love. At that point, Cummings didn’t know very much about drag except that she wanted to be part of it. After the fundraiser, she got to meet two of the performers, Roxy and Chloe, and bombarded them with every imaginable question. “They reminded me that all drag is valid no matter how you identify in your sexuality, gender, or race,” Cummings said. Cummings credits them for being her inspiration to actually make a concrete plan to eventually participate in drag. Her close friends here at Capital also pushed her because of how much passion she showed for the activity. As far as future performances, Cummings wants to do more drag. She loves the history of drag and what it stands for, it gives people the opportunity to become a different character and fight for what they think is right and what they truly believe in. “Drag is art and it is valid for all,” she said. One of the most important things that she realized after her experience was that all of the people that came to the show were so supportive of everyone’s talent. Cummings mentions that the drag scene in Columbus is extremely warm and welcoming, especially within Axis. They helped her with anything she needed and were all very encouraging, especially for this being her first time ever performing. “If anyone out there has ever wanted to try something new or put themselves out there, just do it!” she said. With the support she has from both Pride and her sorority, and after gaining the experience from So You Think You Can Drag, Cummings plans to continue to do drag around Columbus to really hone into her craft.